For people in parts of East Gippsland, North East and West and South Gippsland Forecast Districts. Issued at 10:36 am Monday, 11 February 2019. A vigorous cold front will approach from the west later today before moving quickly through Victoria during Tuesday. 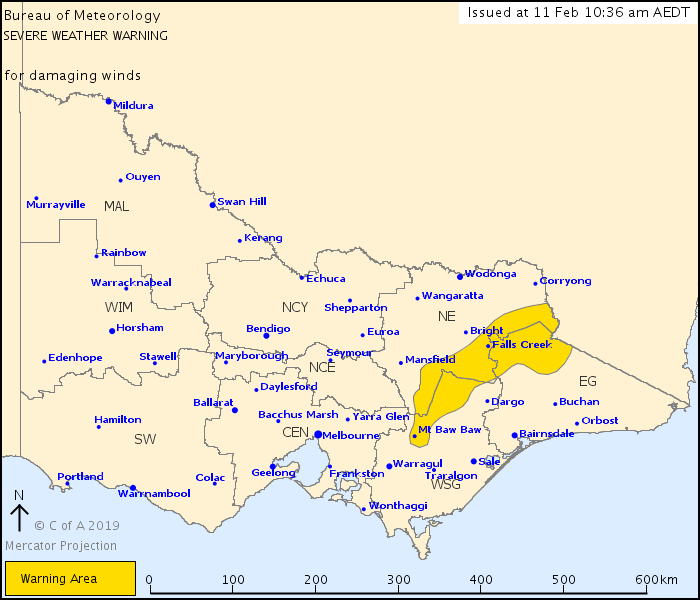 DAMAGING WINDS, averaging 50 to 70 km/h with peak gusts of around 100 km/h are expected to develop during Tuesday morning over Alpine areas (above 1200 metres) of the North East, East Gippsland and West and South Gippsland districts. Locations which may be affected include Mt Baw Baw, Falls Creek, Mt Hotham and Mt Buller.